Oliver Martin developed Monitor CB. CB stands for closed bass. 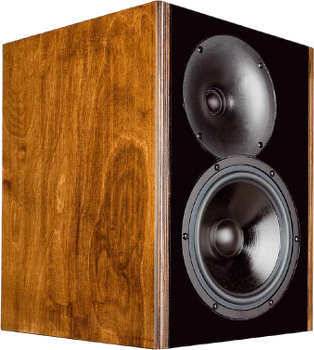 The Monitor CB comprises a Monacor tweeter with wave guide and a Monacor bass driver. The principle is GHP. This denotes "Geschlossene Bauweise mit Hochpass" in German, which means "sealed cabinet with high pass". Here you can find some theory about high pass. The crossover consists of a second order high pass and a second order low pass. Our Kit with high end crossover provides high-quality ClarityCap film capacitors and Mundorf electrolytic capacitors. Mundorf baked varnish coils are used as a coil.